Excellent location, just steps from the beach. Our stay in Atlantic Beach was great. 205 E Boardwalk was a really nice place to stay, convenient to the beach, to places to eat and visit. It was in a nice neighborhood, clean and nicely decorated. 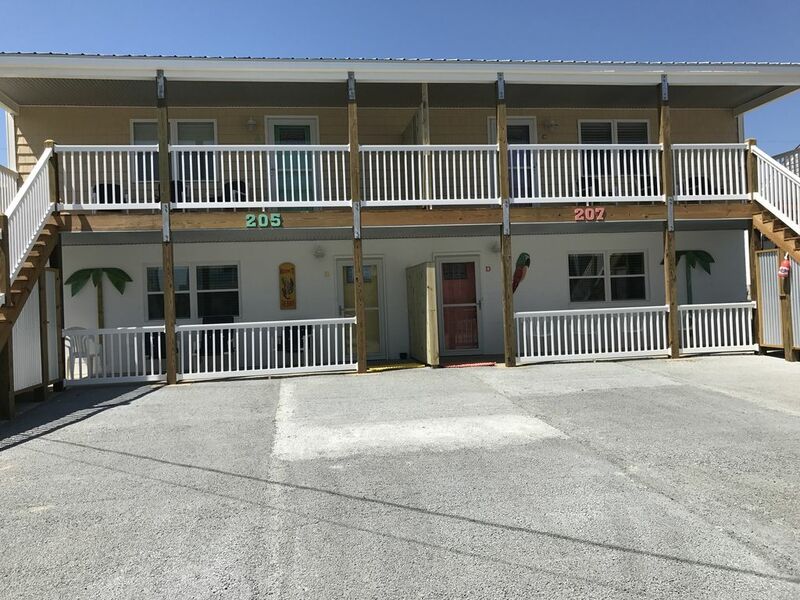 We're looking forward to returning to Atlantic Beach and stay at 205 E Boardwalk! I thoroughly enjoyed my stay. This condo was very clean, had comfortable beds, and the showers had excellent water pressure and stayed hot! There were four people who stayed and we were all very comfortable with plenty of room. Rhonda, the owner, was very accommodating and responded to texts/emails/phone calls immediately. Just a few steps from beach access. I highly recommend staying here and plan on booking again! Great spot with beach access across the street. Gas, convience stores, restaurants and grocery stores all very close. Outdoor shower perfect after day at beach. Clean property. Only thing I would say is since I have used VRBO many times, typically the previous guest staple items (baggies, salt/pepper, other spices, laundry goods, etc) are left for next guest. Not much was left behind or cleaning crew takes it. Will definitely return to this property when travel calls for Atlantic Beach. Great little condo!! Updated, clean and very convenient location! Come spend some time at beautiful Atlantic Beach. Atlantic Beach offers a peaceful family-friendly atmosphere but still offers plenty to do, such as a visit to Fort Macon, browsing local shops, dining out, movies, fishing, boating. The NC Aquarium less than 10 minutes away and there are charming neighboring towns like Morehead City and Beaufort that are great to walkabout, exploring the shops and trying out new restaurants. If you want a little adventure, there are boat tours and day trips to nearby islands where you can go shelling, see wild horses or just spend the day relaxing.